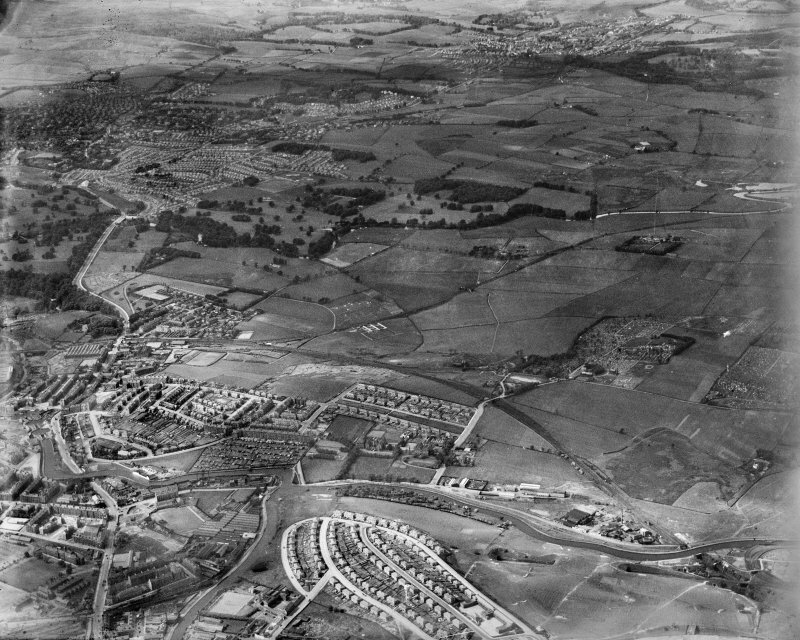 General view, Lambhill, Glasgow, Lanarkshire, Scotland, 1937. Oblique aerial image, taken facing north. This mine was depicted on the 1:10560 scale Ordanance Survey map (Provisional Edition 1958). Information from RCAHMS (MMD) 20 August 1998. Shaft/Mine Details: 2 earlier shafts, 27m (No. 2 NS 5720 6963, No. 3 NS 5724 6962), surface mine (NS 5727 6968). No. 1 (downcast) 1 in 4, 116m, brick and concrete reinforced circle girders, 10' x 8', direct rope haulage. No. 2 (upcast) same dimensions and construction as No. 1, but 110m and 1 in 3, balanced double-drum direct haulage. Details in 1948: Output: nil. Under reconstruction in 1948, mine driving and development in progress. 110 employees. No washer [mechanical equipment for the wet cleaning of coal as apart of coal preparation prior to sale], no baths. Canteen, first-aid room. Electricity supplied by Glasgow Corporation. Report dated 19-08-1948.